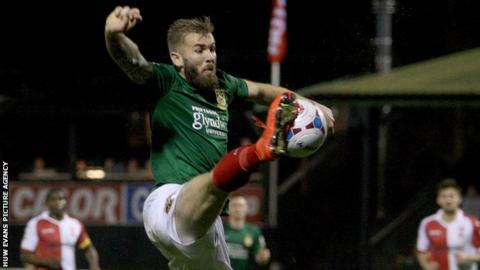 Wrexham came from behind to beat Aldershot to end a nine-game winless run in the Conference. Former Wrexham loanee Dan Holman cut in from the right before firing home from outside the box to give Aldershot the lead. Wes York wasted a good chance before Mark Carrington levelled with a composed finish. Andy Bishop put Wrexham ahead before substitute Louis Moult converted a penalty after Bishop was tripped. "I'm delighted for all the boys that have shown a real character to get through after a difficult start and a thoroughly deserved win. "It pleases me again Andy (Bishop) has got on the score sheet and [Louis] Moult has got off the bench and got on the scoresheet. "Overall the lads have dug in and shown that character and hopefully we will show it again on Tuesday and win that game as well." "We started off well but the energy levels just weren't there and when we do play with the energy we have done over the last 10 games, when it drops off it shows. We weren't able to get into the game and we conceded a poor equaliser and when you're tired physically, mentally you have to make sure your right on it. "We didn't do the basics right today and whether that was tiredness or people trying to do too much but we look visibly lacking in the energy we had done. Most of the side has played in all games in that short period of time and we've put the same 11 out there for necessity really. "You have to credit the players on what they've done recently but it wasn't good enough today and even when things aren't going for you, you have to do the basics right and we didn't. We have to make sure this is something they learn from and highlights when you do things simple and easier it enables you to stay in the game." Match ends, Wrexham 3, Aldershot Town 1. Second Half ends, Wrexham 3, Aldershot Town 1. Foul by Andre McCollin (Aldershot Town). Attempt saved. Louis Moult (Wrexham) right footed shot from outside the box is saved. Substitution, Aldershot Town. Tom Derry replaces Mark Molesley. Mark Molesley (Aldershot Town) wins a free kick. Substitution, Wrexham. Steve Tomassen replaces James Pearson. Substitution, Wrexham. Jay Harris replaces Joe Clarke. Attempt missed. Mark Carrington (Wrexham) right footed shot from the right side of the six yard box misses to the right. Ross White (Wrexham) wins a free kick. Goal! Wrexham 3, Aldershot Town 1. Louis Moult (Wrexham) converts the penalty with a right footed shot to the bottom left corner. Penalty conceded by Glenn Wilson (Aldershot Town) after a foul in the penalty area. Penalty Wrexham. Louis Moult draws a foul in the penalty area. Attempt missed. Andy Bishop (Wrexham) header from outside the box is too high. Substitution, Aldershot Town. Dan Fitchett replaces Kieran Forbes.